Grade school students are led by a Class Teacher, who provides primary academic instruction and leads a class through the grades. 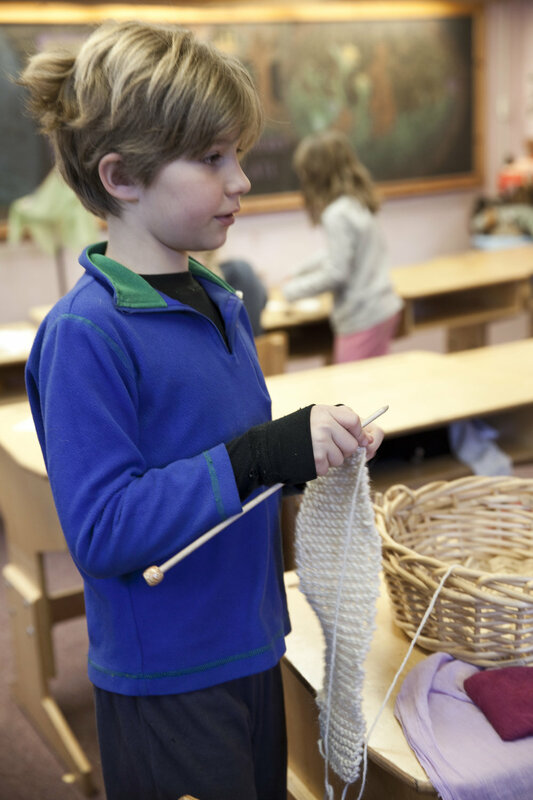 This approach is fundamental to Waldorf education and enhances student engagement, increases instructional time and improves academic performance. Students also work with special subject teachers who are experts in French, music, fine arts, practical arts and movement. Ready for academic exploration, first graders love to learn through movement, stories and the arts. Language lessons come to life through poetry and song, students fill their Main Lesson books with illustrations that represent letters of the alphabet, mental math practice begins and there is plenty of time for the outdoors and free play. The students and their Class Teacher begin a multi-year journey together and special subject teachers introduce French, handwork and movement. Teachers inspire an interest in learning and cultivate a spirit of respect and group cohesion, which will carry the class through their grade school years. By second grade, students possess an emerging a sense of themselves, as well as a growing awareness of the perspectives, values, imperfections and gifts of those around them. They begin to recognize the impact of individual actions and are drawn to stories of the saints and legends of noble people with purpose. They identify with animal characters from stories such as Aesop’s Fables and Native American and African Legends. Recitation of poems, rhymes and tongue twisters help students with phonetic awareness and clarity of speech as they delve into reading. They learn cursive writing and work with addition, times and division tables as well as borrowing and place value. Around the age of nine, students begin to think more independently and critically, sensing that one day they will make their own way in the world. Inspired to learn about the practicalities of everyday life, third graders explore measurement, time and money. They work hands-on outside the classroom cooking and building shelters. In the classroom, students continue academic practice in reading, writing, grammar and mathematics and begin to read musical notation on their wooden flutes. 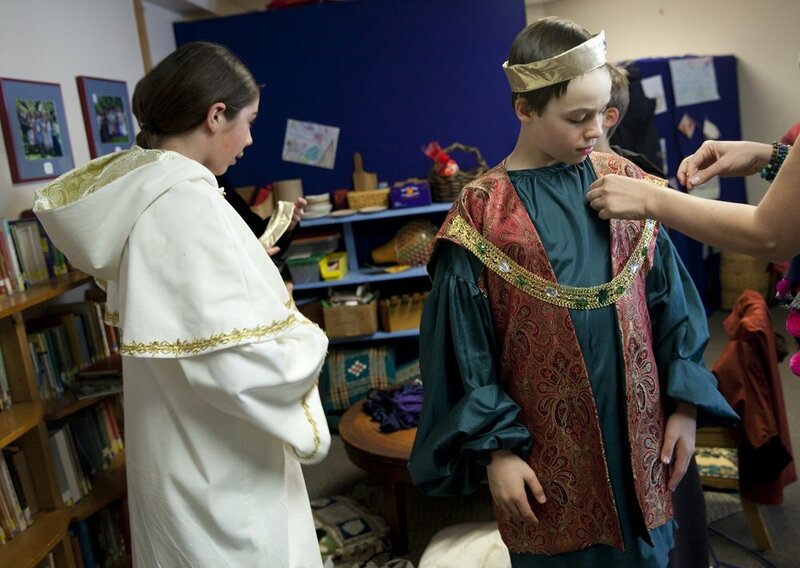 They explore the stories and themes of the ancient Hebrew people who seek a home on earth and build community. Fourth graders are becoming more independent, developing a curiosity about the world and how people choose to live in it. Throughout the year, students learn about their environment, the animal kingdom and New Hampshire geography and history. They are eager to work and ready to take up the complexity of new subjects like fractions, violin, chorus and clay modeling. Captivated by stories of adventure and misadventure and identifying with heroes and larger-than-life characters, Norse Mythology and epic tales in world literature provide the backdrop for fourth grade work in reading, grammar and descriptive writing. With new capacities for thought and reflection, fifth graders are excited begin their study of human history, world geography and ancient civilizations. Students possess an emerging sense of community and personal responsibility and are creative, confident and eager to work cooperatively. In mathematics, students delve into the relationships between numbers through ratios and proportions. They explore the physicality of the earth through the world of plants — trees, flowers, algae, mushrooms and mosses, as well as the geography and climate that influences plant growth. Woodworking is introduced and each student begins studying an instrument of his/her choice to play in the beginning strings or band group. New academic challenges and social experiences mark this turning point to the middle school years, with independent research, sports teams and musical ensembles. Sixth graders are more physically grounded, showing an emergent power of conceptual thinking and a deeper comprehension of cause and effect. Students explore the laws of the universe in Astronomy, the structure of the earth in Geology and the practical nature of business math and grammar skills. The class examines the rise of Rome — the spirit of conquest, development of the rule of law and construction of roads, buildings and aqueducts — as well as the excesses that resulted in its collapse and Western civilization's plunge into the Dark Ages. Students discover what moved history forward into the Renaissance, like early Islamic civilization, the study of Algebra, early Church music and the ideals of knighthood, valor and chivalry. Seventh graders reach a stage of self-reflection and introspection. Challenged with increasingly rigorous academics, they are eager for knowledge, independence and social connection. The Renaissance, Reformation, Scientific Revolution and Age of Exploration are a major academic focus and they read biographies of historical figures who challenged prevailing views in search of truth, freedom and self-expression. 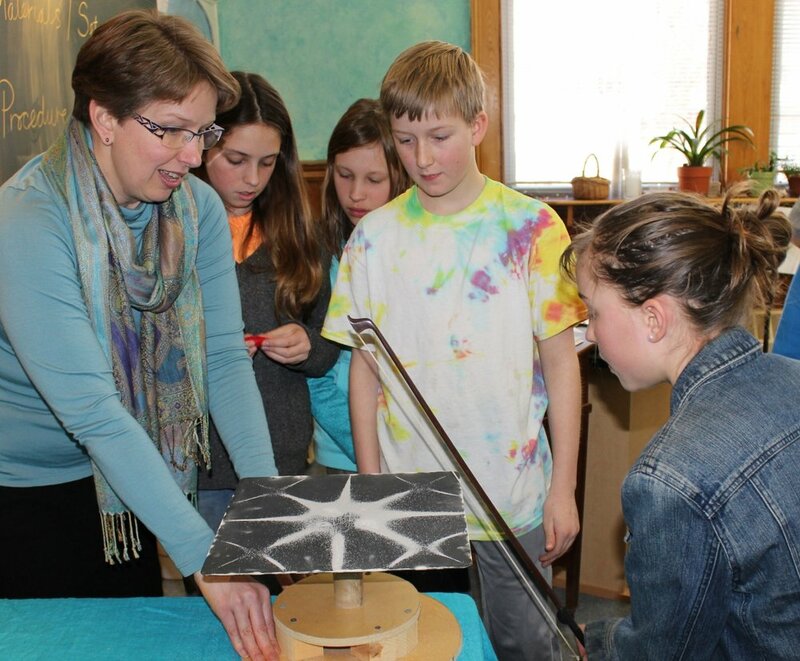 Seventh graders are introduced to algebra and plane geometry, the interrelationship of chemical properties and the physical laws of refraction, reflection, acoustics and heat. They study Renaissance artists and their use of geometric principles to develop the laws of perspective, as well as the form and function of their own bodies through blocks on anatomy and physiology. By eighth grade, students have developed strong observational skills and reasoning abilities. They serve as role models for younger students and work productively on class projects and performances, as well as independent research, writing and presentation. Eighth graders study organic chemistry, construct the five three-dimensional Platonic solids in geometry and discover the mechanical principles that led to the development of our technological society. Students examine U.S. History, world events and the people who helped define our time. And from the Industrial Revolution to the present day, the class explores major political and cultural events that shaped the modern world, with an emphasis on the ideals of human freedom that led to the American, French and Russian Revolutions.